It’s fascinating, really, how much we’ve come to associate the two men with each other. In some ways, it makes perfect sense. Porter and Coward share a witheringly wry sensibility, an inveterate inclination toward the droll, and a decided penchant for the sophisticated, world-weary observation. Both men also relish in the risqué, and seem to revel in the possibility of slipping that well-turned double entendre past the dull-witted censor or self-appointed guardian of public morality. Cole Porter and Noël Coward were born on opposite sides of the Atlantic, but both won renown for their wit, sophistication, and memorable melodies. 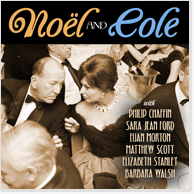 NOËL AND COLE cleverly alternates songs by these two musical-theatre masters, as it compares and contrasts their views on show business, high society, civic pride, and of course, love and loss. Six Broadway and PS Classics favorites -- Sara Jean Ford (How To Succeed In Business Without Really Trying, PS Classics' Sweet Little Devil), Elizabeth Stanley (Encores’ Merrily We Roll Along, Million Dollar Quartet, Cry-Baby), Barbara Walsh (Falsettos, Big, Company), Philip Chaffin (PS Classics' When the Wind Blows South, plus studio cast recordings of Sweet Bye and Bye and Sweet Little Devil), Euan Morton (Sondheim on Sondheim, Taboo) and Matthew Scott (Sondheim on Sondheim and PS Classics' Jerome Kern: The Land Where the Good Songs Go) -- offer unforgettable renditions of Porter standards like “Begin the Beguine,” “In The Still of the Night” and “I Concentrate on You,” and Coward classics such as “If Love Were All,” “Sail Away,” and “Mad About the Boy” -- all newly arranged by David Loud and orchestrated by Jason Carr. 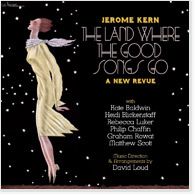 Of this new album, Talkin' Broadway raved,"The next best thing to having been to a marvelous party with Noël Coward and Cole Porter on either side of you might just be Noël and Cole the CD." Naming it one of the top 10 vocal albums of 2013, they hailed it as "a real feast and a romp. Many of the writers' better-known pieces are on display, given top renditions by strong theatre singers, who've already made their marks with PS Classics' cast albums, including studio cast recreations, in recent years. Featuring some of the most accessible numbers from the work of the masters, this album can serve as an introductory overview for the uninitiated and a welcome revisit for fans, who'll find nice colors in these new coats of paint to the twin houses." Another Op'nin', Another Show / Why Must the Show Go On?